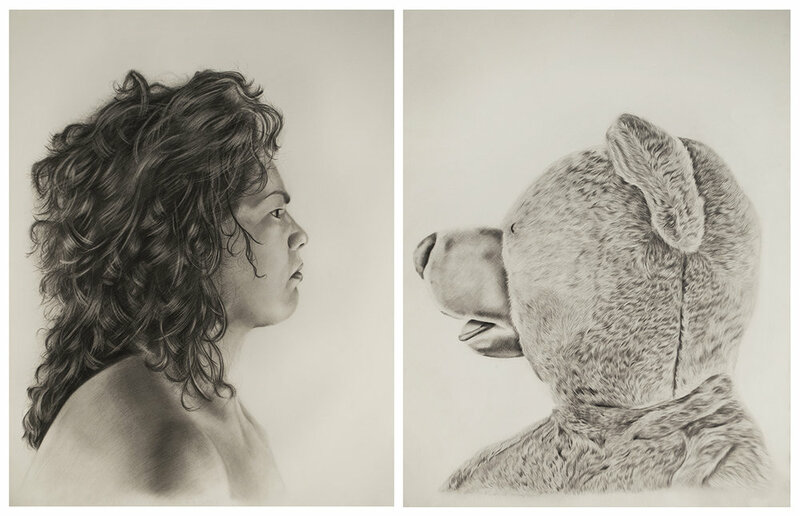 Princess Ileana vs. Lester the Molester, 2016, diptych, 30 x 22 inches each, Graphite on paper. She has been artist in residence at the New York Arts Residency and Studios (NARS) Foundation, NY, Chashama, NY, Tyrone Guthrie Centre, Ireland and KulttuuriKauppila, Finland. Brigitta won the ArtSlant Prize 2016 Grand Prize and she is a recipient of numerous awards including Arts Council of Ireland Travel and Training Award, Arts Council of Ireland Artists in Prison Scheme Award, Leitrim County Council Arts Bursary, Culture Ireland Award. Brigitta was acknowledged for her contribution to the arts of Ireland by the President, Mary Mc Alesse, 2008. In addition to developing her own practice, Brigitta works on commissions and exhibitions, developing projects with people of all ages and abilities within the community sector, schools, prisons and arts centers. She has co-designed and facilitated the Creative Lab for the United Nation Framework Convention on Climate Change, May 2013, Bonn, Germany. She currently working on a collaborative public art commission, by Sligo County Council (Ireland) with artists Catherine Fanning for the Nazareth Care Village and on her upcoming solo show in May 2017 at the Budapest Gallery, Hungary. His interest in theatrical music has resulted in ballets for the Pennsylvania Ballet, Murray Louis, Dance Theatre Workshop, Louis Falco, Jeff Duncan, London Contemporary Dance Theatre, and four collaborations with Alwin Nikolais, as well as incidental music for Tennessee Williams’ Outcry and numerous scores for PBS Television. In 1972, his opera The Innocent was produced in Philadelphia by Tito Capobianco. His orchestral and chamber music has been performed throughout the United States by such artists as pianists Lydia Artymiw Beth Levin, Steve Beck and Marcantonio Barone, violinists Diane Monroe and Miranda Cuckson, violist Brett Deubner, cellists Sam Magill and Eugene Moye, percussionist Anthony Orlando, of the Philadelphia Orchestra, flutists Mimi Stillman and Patricia Spencer, and clarinetist Ronald Reuben. Recent concertos for Violin, Viola, and Piano have brought him renewed recognition. “Extroverted, engaging and driven by an almost heroic sense of drama, Rudin has a gift for the kind of gesture that grabs you by the ears and won’t let go.”, wrote the Washington Post at the 2008 premiere of his Piano Concerto. Of the Viola Concerto, Fanfare magazine declared “The concerto is an important addition to the none-too-large repertoire for this instrument.” He is the recipient of fellowships from Yaddo, The MacDowell Colony, Ucross Foundation, Virginia Center for the Creative Arts and The Pennsylvania Council on the Arts, among his many grants and awards. His teachers have included George Rochberg, Karlheinz Stockhausen, Ralph Shapey, Kent Kennan, and Paul Pisk. He has taught on the faculties of the Juilliard School and The Philadelphia College of the Performing Arts, where he was founding director of the Electronic Music Center. He is retired from the faculty of The University of the Arts (Philadelphia), where he taught from 1964 to 2001. His music may be heard on the Centaur, Innova, and ERM labels, and is published by Associated Music Publishers as well as Skåne Hill Music. The composer’s professional affiliation is BMI. David B. Smith, Extruded Daydream, 18 soft sculptures and 6 wall hanging fabric collages, 25 x 25 x 10 ft. installation, 2016. Photo courtesy of the artist. David B Smith makes fabric-based photo-sculpture that explores fantasy, loss, commodity, and connection in American culture. To gain access to the back-end of cultural memory, he playfully rearranges iconography using pseudo programming code - comprised of digital and analog fragmentation, accreditation, and reorientation. He isolates patterns, crosses wires, and entertains poetic interpretations, making the once familiar strange and unsettling, yet oddly cozy. His work has appeared in exhibitions at MoMa PS1, The International Center of Photography, Yancey Richardson Gallery, Asia Song Society, John Connelly Presents, with recent solo shows at The Spring Break Art Show, Halsey McKay Gallery, and Calico Gallery. His work has been discussed in the New York Times, The Observer, Art Fag City, the Washington Post, and Miami New Times. Smith holds an MFA from Bard College and has been awarded residencies by Apex Art, New Zealand; Franconia Sculpture Park, Shafer, MN; Harold Arts, Ohio; Socrates Sculpture Park, The Waterpod Residency, The Art and Law Program, and the BOFFO residency, New York. He lives and works in Brooklyn, NY.